The MGSW-28240F is specially designed for service providers to deliver profitable Ethernet network. It is equipped with advanced management functions and provides 24 100/1000Mbps dual speed SFP Fiber ports, 4 10Gbps SFP Fiber ports, and 4 10/100/1000Mbps TP/SFP combo ports delivered in a rugged strong case. 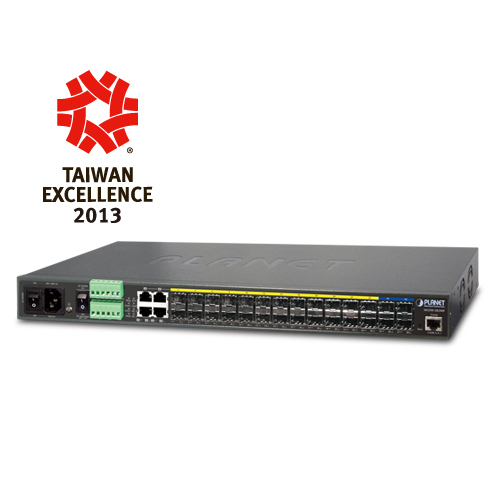 The MGSW-28240F is capable of providing non-blocking switch fabric and wire-speed throughput as high as 128Gbps in the temperature range from -10 to 60 degrees C without any packet loss and CRC error. It greatly simplifies the tasks of upgrading the enterprise LAN for catering to increasing bandwidth demands. To enhance the operation reliability and flexibility, the MGSW-28240F is equipped with one 100~240V AC power supply unit and two additional 36~60V DC power input connectors for redundant power supply installation. The Redundant Power Systems are specifically designed to handle the demands of high tech facilities requiring the highest power integrity. Furthermore, with the 36~ 60V DC power supply implemented, the MGSW-28240F can be applied as the telecom level device that could be located in the electronic room. ■ Input Load Current: 10mA max. 2014-04-16 1.2 Change DC input from 72V to 60V. 2014-04-16 1.1 Change DC input from 72V to 60V.